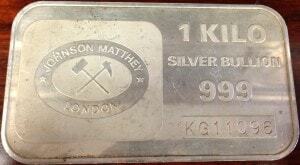 ALL ENGELHARD is pleased to welcome visitors to our Johnson Matthey 1/2 KILO and KILO Definitive Page. While our focus is clearly Engelhard, we recognize that many Engelhard bullion collectors also collect Johnson Matthey bars and ingots. As such, we appreciate the opportunity to present important bullion information on the world’s second most collectible refiner, Johnson Matthey. We hope you welcome this new addition, and we look forward to your thoughts and input! 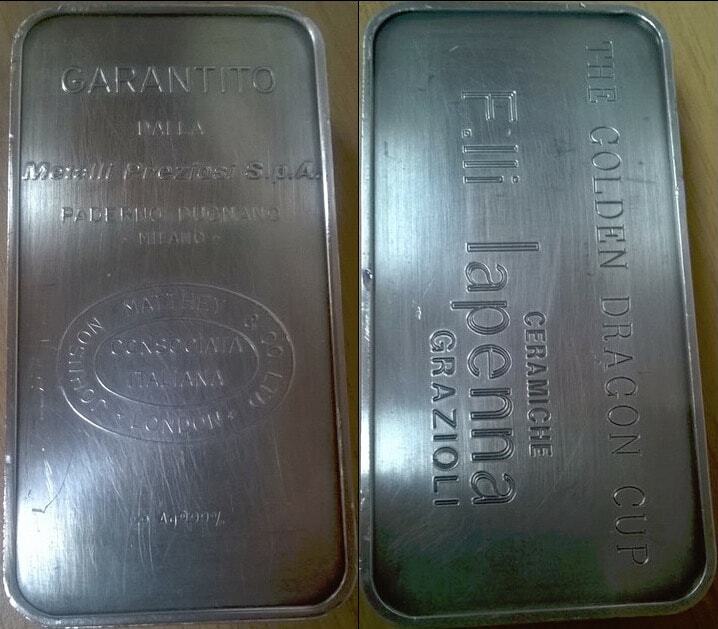 Our Definitives, below, are organized in presentation of Half Kilo weight class first, followed by Kilo examples. For each weight class, our order of examples is presented by region of origin: United States, Canada, London, Brussels and Australia. Also note that our Definitives reflect what we believe to be the earliest examples first, followed by more recent production examples. 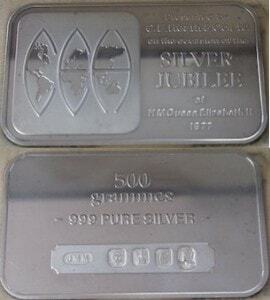 500g [Diamond JM Logo with Crossed Hammers] [500 G] [999+] [JM LTD. ASSAY OFFICE Oval Logo] [CANADA Inner Oval] Cast Finish 500g example produced by Johnson Matthey, Canada. 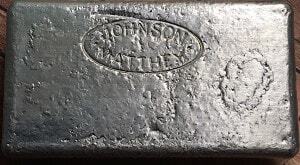 1/2 KILO [JOHNSON MATTHEY & MALLORY Oval Logo] [CANADA Inner Oval] [1/2 KILO]  [JM LTD. ASSAY OFFICE Oval Logo] [CANADA Inner Oval] Cast Finish 1/2 KILO example produced by Johnson Matthey & Mallory, Canada. Originally issued in felt presentation bag, pictured below. 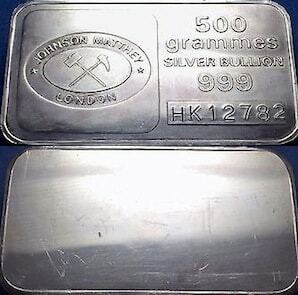 [JOHNSON MATTHEY LONDON Oval Logo] [Mining Tool Logo Inner Oval] [500 grammes] [SILVER BULLION]  [Serial Number] Blank 500g pressed example produced by Johnson Matthey, London. Originally issued in presentation case, pictured below. 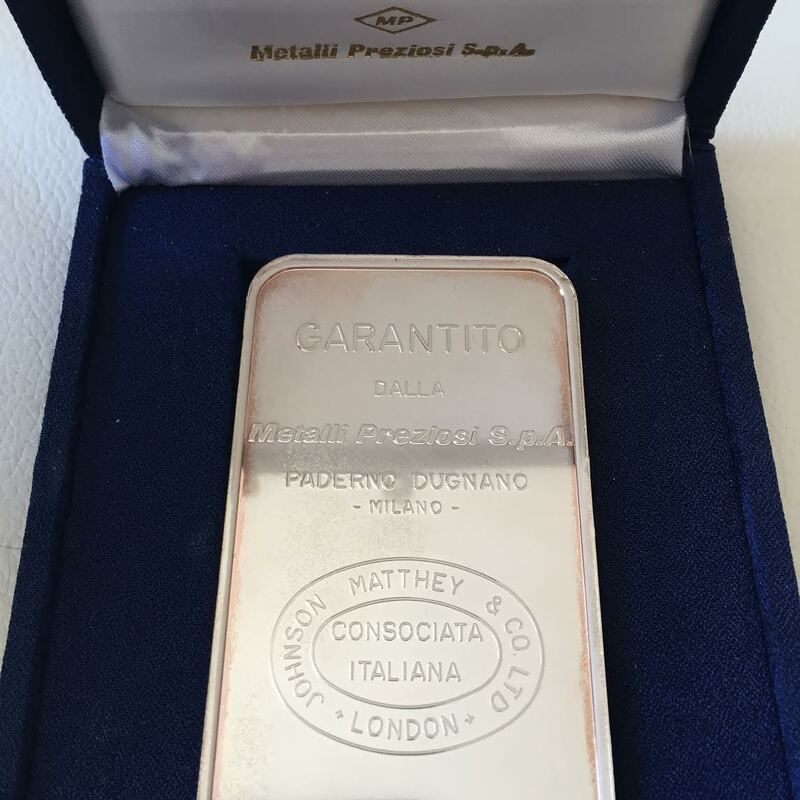 500g [GARANTITO] [DALLA] [METALLI PRIZIOSI S.p.A.] [PADERNO DUGNANO] [MILANO] [JOHNSON MATTHEY & CO. LTD. – LONDON Oval Logo] [CONSOCIATA ITALIANA Inner Oval] [-Ag999 0/00] [MP Diamond Logo] [500 GRAMMI] [FINE SILVER] [999.0] [MADE IN ITALY] 500 gram MP example produced by Johnson Matthey, Italy. Originally issued in presentation case, pictured below. 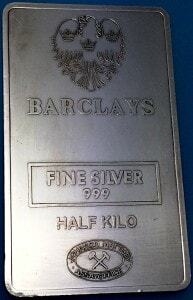 HALF KILO [BARCLAYS Logo] [BARCLAYS] [FINE SILVER 999] [HALF KILO] [JOHNSON MATTHEY LONDON Oval Logo] [Mining Tool Logo Inner Oval] Blank HALF KILO example produced by Johnson Matthey, London, for Barclays. 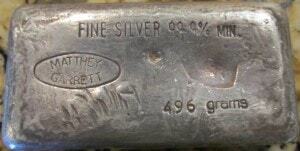 502g [W&H Flag Logo] [MG Matthey Garrett Circular Hallmark] [502 Gm] [Serial Number] [•999] Cast Finish 502g example produced by Matthey Garrett, Australia. 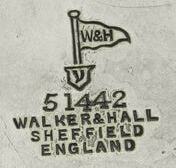 Interestingly, the W&H flag represents Walker & Hall of Sheffield, England, pictured below. 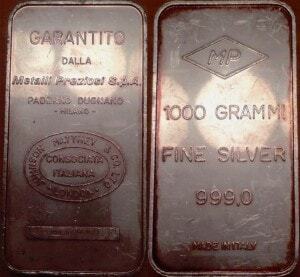 .501kg [W&H Flag Logo] [MG Matthey Garrett Circular Hallmark] . 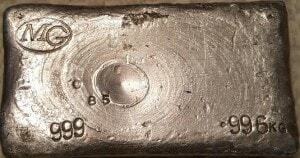 [501 kg] [Serial Number] [•999] Cast Finish .501kg example produced by Matthey Garrett, Australia. Interestingly, the W&H flag represents Walker & Hall of Sheffield, England, pictured below. 501kg [JM Mining Tool Logo] [999+] [•501Kg] [W&M Flag Logo] [Serial Number] Cast Finish .501kg example produced by Johnson Matthey, Australia. Interestingly, the W&H flag represents Walker & Hall of Sheffield, England, pictured below. 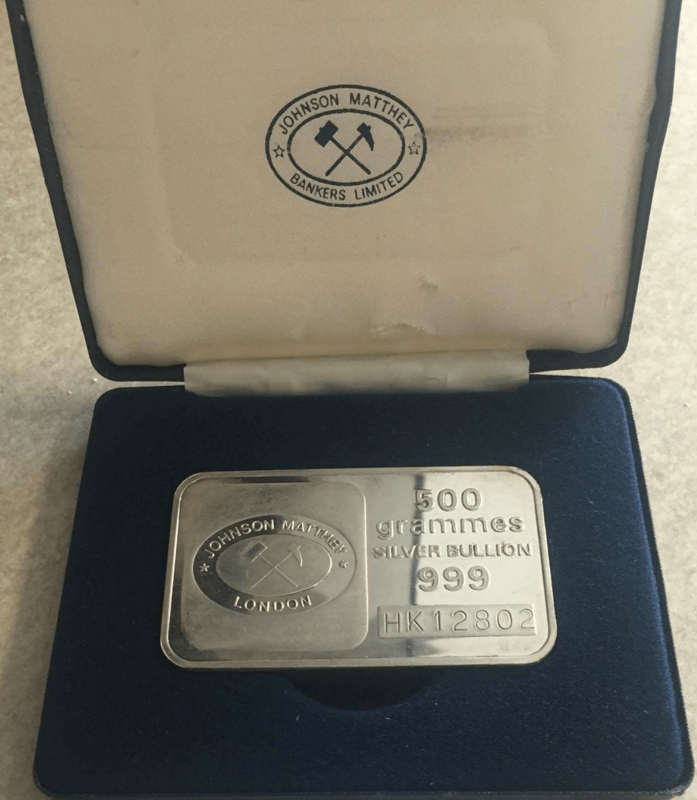 1 KILO [Diamond JM Logo with Crossed Hammers] [1 KILO] [999+] [JM&M LTD. ASSAY OFFICE Oval Logo] [CANADA Inner Oval] Cast Finish 1 KILO example produced by Johnson Matthey, Canada. 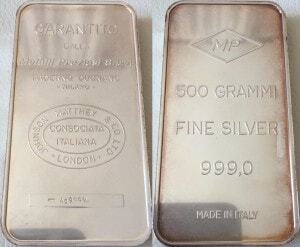 Similar to some of our above examples but demonstrates a more widely spaced ‘1 KILO’ weight class stamp and tighter spacing between the ‘999+’ purity stamping. 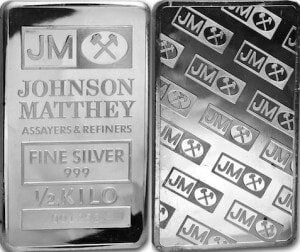 1 KILO [Diamond JM Logo with Crossed Hammers] [1 KILO] [999+] [JM&M LTD. ASSAY OFFICE Oval Logo] [CANADA Inner Oval] Cast Finish 1 KILO example produced by Johnson Matthey, Canada. 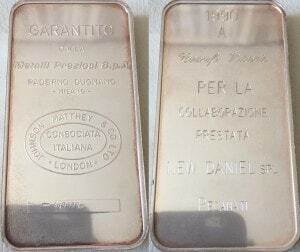 Note the tighter spacing on both the ‘1 KILO’ weight class stamp and the ‘999+’ purity stamp. 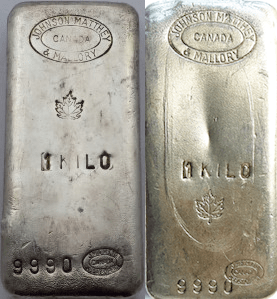 1 KILO [Diamond JM Logo with Crossed Hammers] [1 KILO] [Serial Number] [999+] [JM LTD. ASSAY OFFICE Oval Logo] [CANADA Inner Oval] Cast Finish 1 KILO example in ‘A’ serial suffix, produced by Johnson Matthey, Canada. 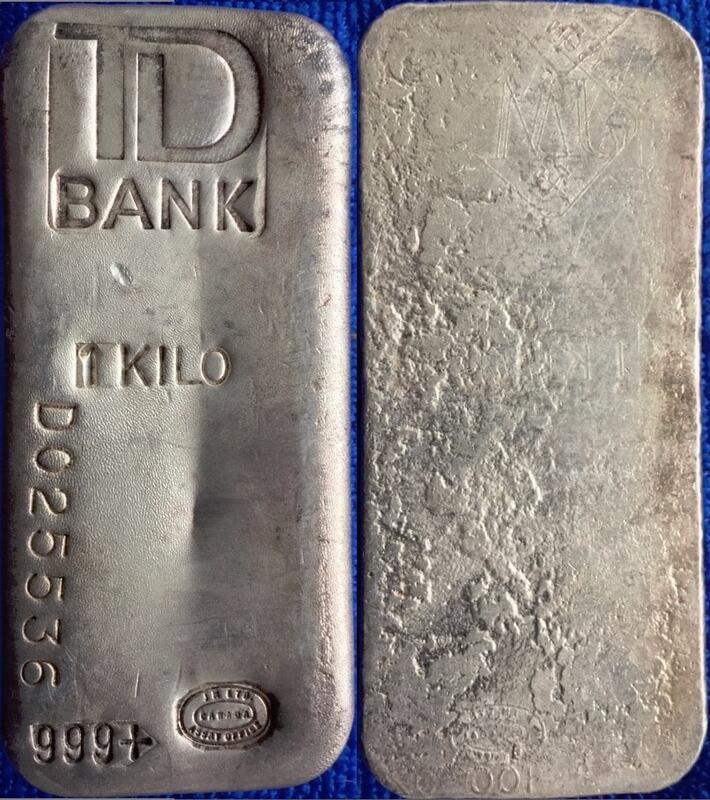 1 KILO [Diamond JM Logo with Crossed Hammers] [1 KILO] [Serial Number] [999+] [JM&M LTD. ASSAY OFFICE Oval Logo] [CANADA Inner Oval] Cast Finish 1 KILO example in ‘D’ serial suffix, produced by Johnson Matthey, Canada. 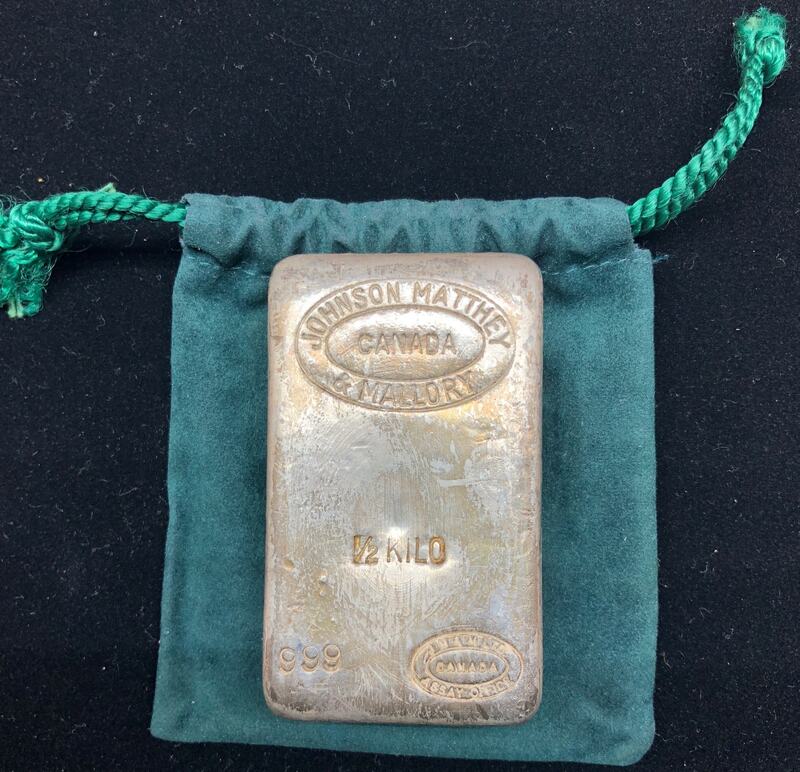 1 KILO [Diamond JM Logo with Crossed Hammers] [1 KILO] [999+] [JM&M LTD. ASSAY OFFICE Oval Logo] [CANADA Inner Oval] Cast Finish 1 KILO example produced by Johnson Mathey, Canada. 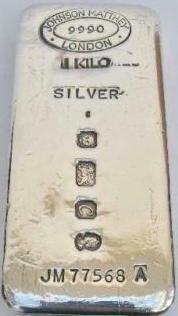 This example demonstrates the smaller Diamond Hallmark and wider spacing on the ‘999+’ purity stamp. 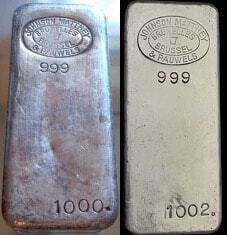 1kg [Diamond JM Logo with Crossed Hammers] [1 Kg] [Serial Number Sideways on Right] [999+] [JM&M LTD. ASSAY OFFICE Oval Logo] [CANADA Inner Oval] Cast Finish 1kg example produced by Johnson Matthey, Canada. 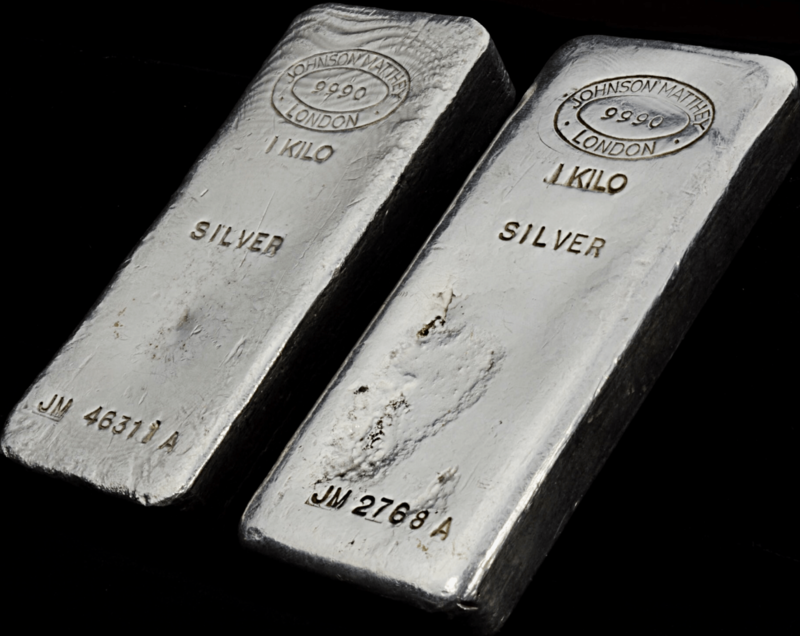 Similar to above example with exception of opposite serial number placement and ‘1 Kg’ vs. ‘1 KILO’ weight class designation. At least two known examples demonstrate a unique set of initial stamps above the Diamond Logo that we believe were applied post-production, pictured below. 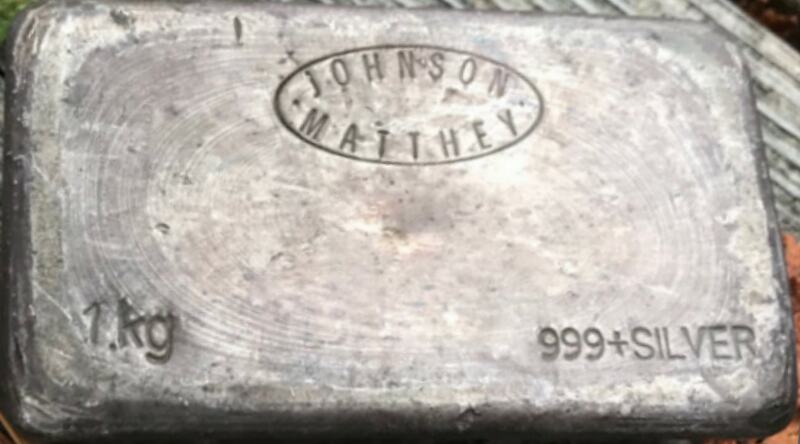 1kg [JOHNSON MATTHEY] [Diamond JM Logo with Crossed Hammers] [1 Kg] [Serial Number Sideways on Right] [999+] [JM&M LTD. ASSAY OFFICE Oval Logo] [CANADA Inner Oval] Cast Finish 1kg example produced by Johnson Matthey, Canada. This example demonstrates a very rare weight class stamp for this variety. 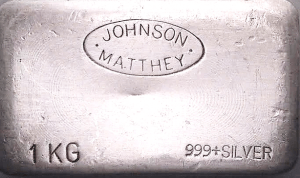 1kg [JOHNSON MATTHEY] [Diamond JM Logo with Crossed Hammers] [Serial Number Sideways on Left] [1 Kg] [999+] [JM&M LTD. ASSAY OFFICE Oval Logo] [CANADA Inner Oval] Cast Finish 1kg example produced by Johnson Matthey, Canada. This example is similar to our above example, though has the serial number on the opposite side. 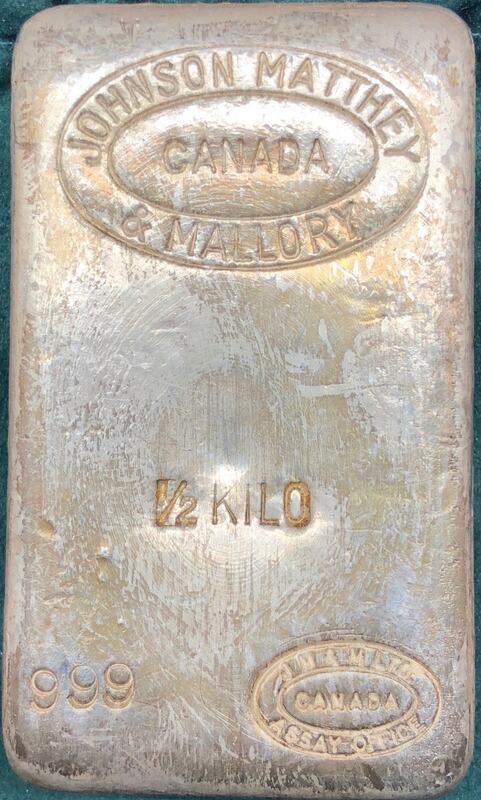 1 KILO [JOHNSON MATTHEY & MALLORY Oval Logo] [CANADA Inner Oval] [JM Maple Leaf Logo] [1 KILO]  [JM&M LTD. ASSAY OFFICE Oval Logo] [CANADA Inner Oval] Cast Finish 1 KILO example produced by Johnson Matthey & Mallory, Canada. Similar to our above example, but includes the Maple Leaf logo, occasionally observed in varying placement, as shown in the supplemental photo. 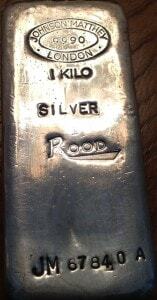 The varying placement of these stampings resulted from the refinery employee applying the the stamp to the most appropriate location, based on differences in obverse finish. Our mintage estimate is representative of both variations on this example. 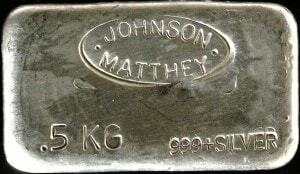 1 KILO [JOHNSON MATTHEY & MALLORY Oval Logo] [CANADA Inner Oval] [1 KILO]  [JM&M LTD. ASSAY OFFICE Oval Logo] [CANADA Inner Oval] Cast Finish 1 KILO example produced by Johnson Matthey & Mallory, Canada. 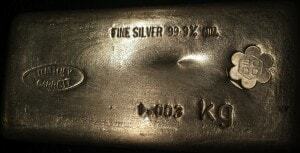 We believe the ‘0007’ serial number on the example below was applied post-produciton. 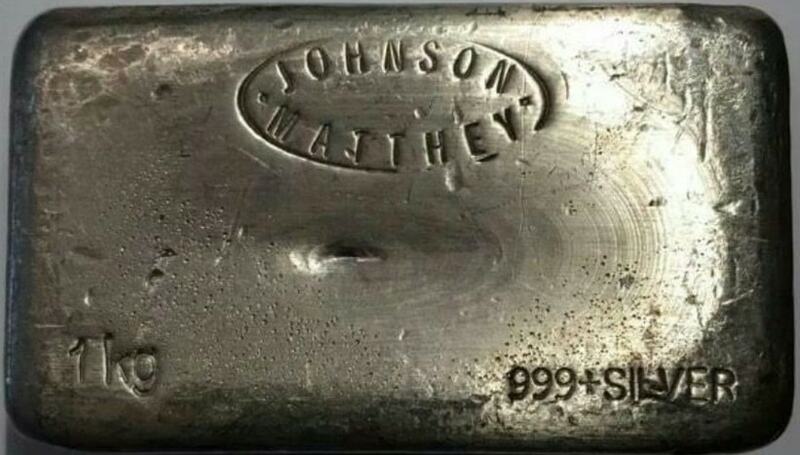 1 KILO [JOHNSON MATTHEY & MALLORY Oval Logo] [CANADA Inner Oval] [1 KILO] [999+] [JM&M LTD. ASSAY OFFICE Oval Logo] [CANADA Inner Oval] Cast Finish 1 KILO example produced by Johnson Matthey & Mallory, Canada. Similar to our above example but includes a ‘+’ on purity stamp. 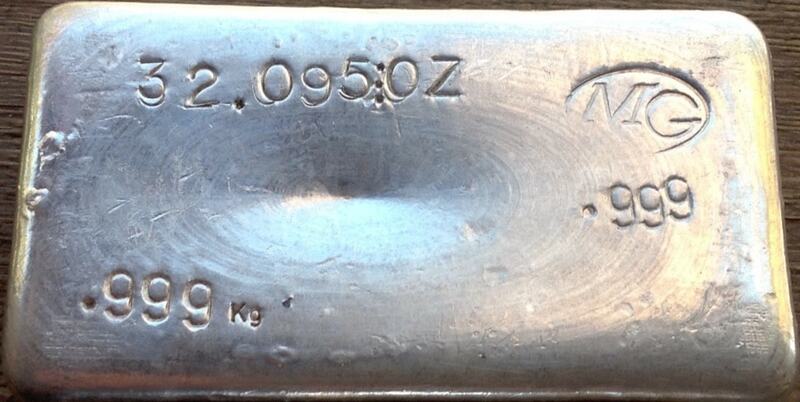 We believe the ‘0007’ serial number on the example below was applied post-produciton. 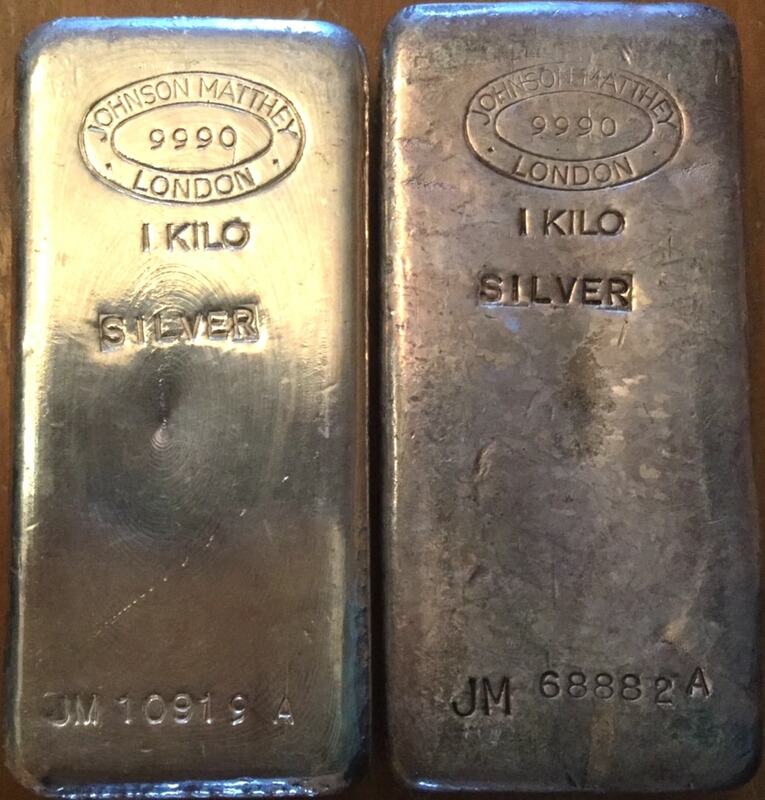 1 KILO [JOHNSON MATTHEY LONDON Oval Logo] [9990 Inner Oval] [1 KILO] [SILVER] [Serial Number] Cast Finish 1 KILO example produced by Johnson Matthey, London, in large JM serial prefix font. 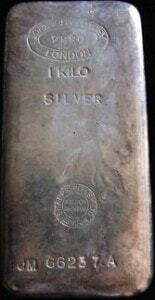 Believed to be the earliest production variety of the JM serial prefix kilo ingots. 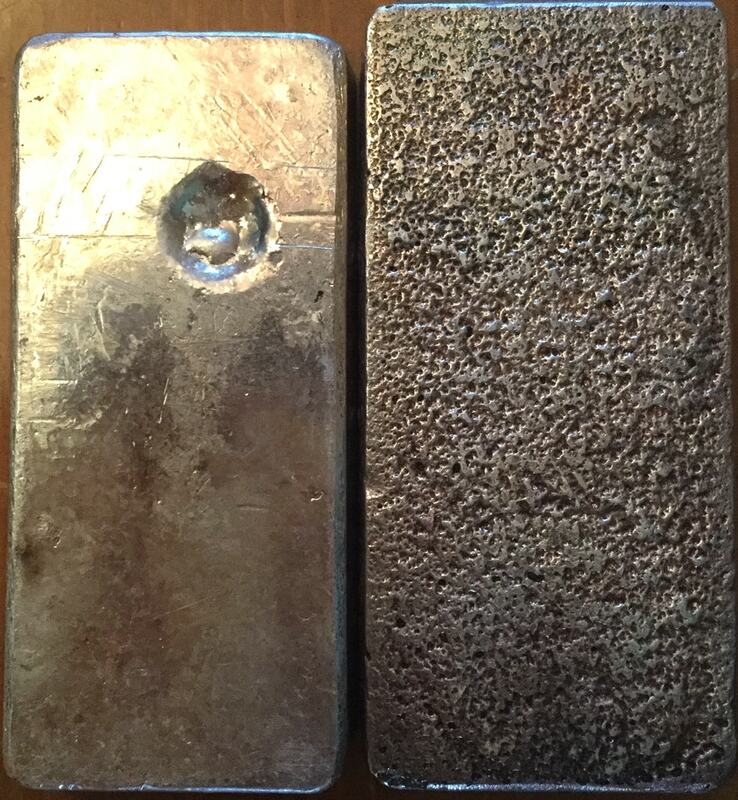 Note the unique shape of the casting mould and crater-like finish compared to the more common JM prefix kilo ingots presented below. 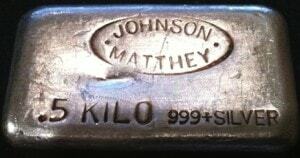 1 KILO [JOHNSON MATTHEY LONDON Oval Logo] [9990 Inner Oval] [1 KILO] [SILVER] [Serial Number] Cast Finish 1 KILO example produced by Johnson Matthey, London. 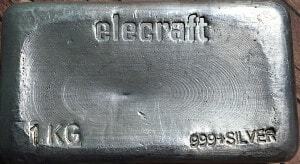 Similar to our more commonly produced example below, but of a unique casting mould and four digit serial number assignment. Casting mould variances may be observed in the below photos. 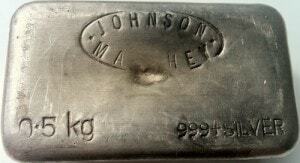 1 KILO [JOHNSON MATTHEY LONDON Oval Logo] [9990 Inner Oval] [1 KILO] [SILVER] [Serial Number] Cast Finish 1 KILO example produced by Johnson Matthey, London. 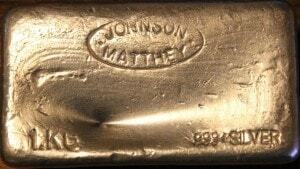 1000g [JOHNSON MATTHEY & PAUWELS Oval Logo] [BRUXELLES BRUSSEL Inner Oval]  [1000.] 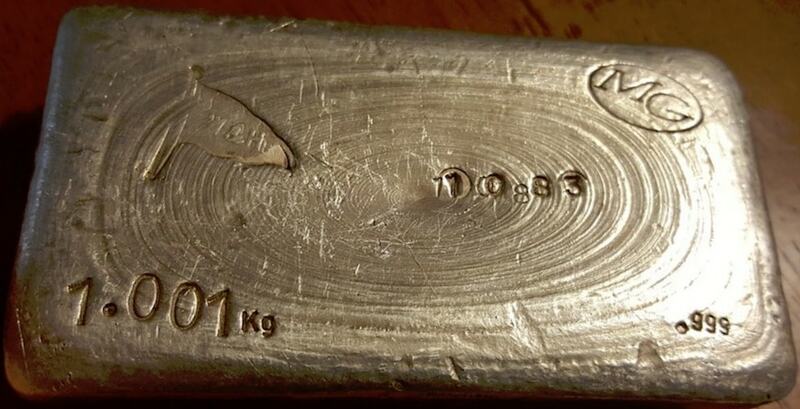 Cast Finish 1000g example produced by Johnson Matthey & Pauwels, Brussels. 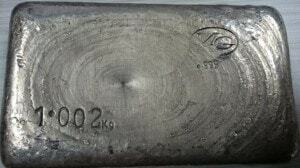 Also found in other approximate weight class variations such as 999g and 1002g. 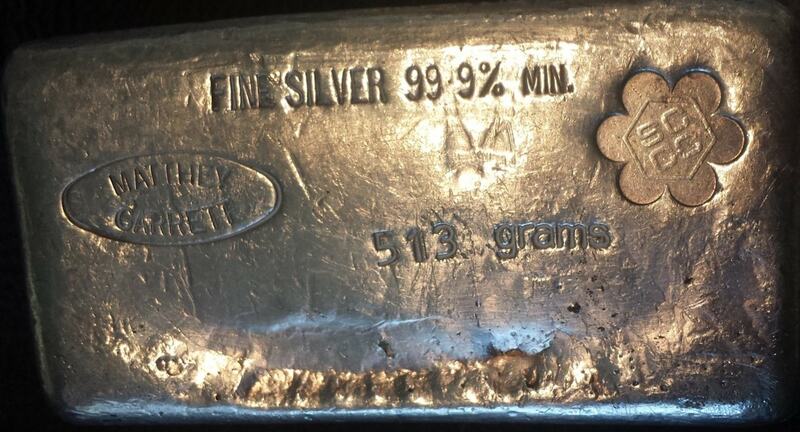 1.003kg [FINE SILVER 99•9% MIN.] 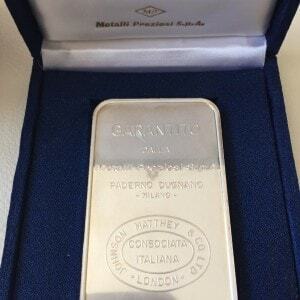 [MATTHEY GARRETT Oval Logo] [SCCA Counterstamp] [1.003 kg] Cast Finish 1.003kg example produced by Matthey Garrett, Australia. Seen in approximate 1kg weight class. 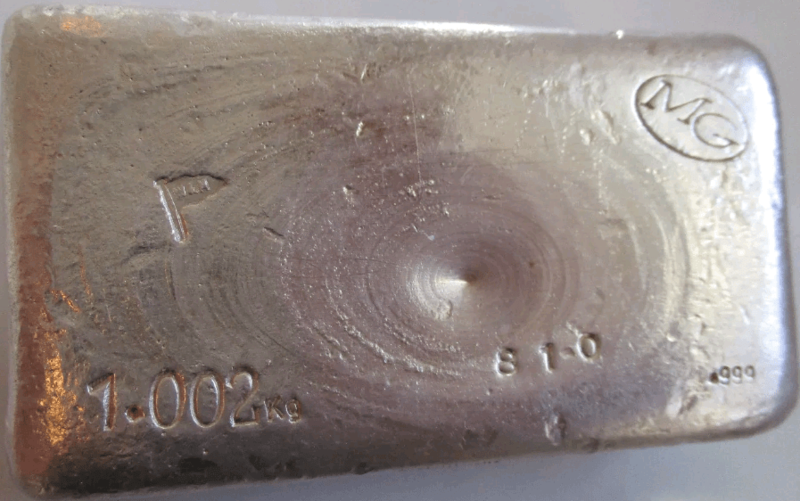 Similar to our example above, this example demonstrates the SCCC [Southern Cross Coins & Commodities ] counterstamp. At least one known example, pictured below, demonstrates an inverted SCCC stamp. 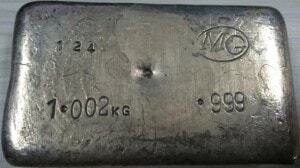 1.002Kg [W&M Flag Logo] [MG Oval] [1•002Kg] [Serial Number] [•999] Cast Finish 1.002kg example produced by Matthey Garrett, Australia. 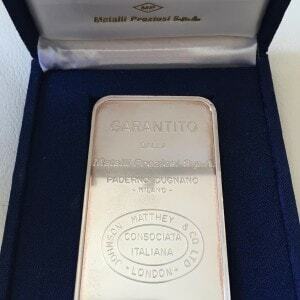 Seen in approximate 1kg weight class and similar to our example above but includes a serial number and the the W&H flag logo. The flag represents Walker & Hall of Sheffield, England, pictured below. 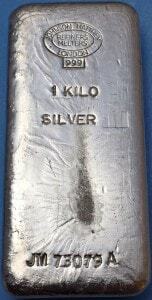 1.001Kg [W&M Flag Logo] [MG Oval] [1•002Kg] [Serial Number] [•999] Cast Finish 1.001kg example produced by Matthey Garrett, Australia. Seen in approximate 1kg weight class and similar to our example above but includes a larger variation of the W&H flag logo. The flag represents Walker & Hall of Sheffield, England, pictured below. Our thanks to Josh M. for the discovery of this variation!